HCM CITY —Shareholders of leading food company Vissan Joint Stock Company approved a number of targets for 2019 at its annual general meeting yesterday. They include pre-tax profit of VNĐ200 billion (US$8.6 million) on revenues of VNĐ4.85 trillion ($208.9 million), respectively 14 per cent and 9 per cent up. Its fresh meat and processed food output are expected to increase by 10 per cent to 28,092 tonnes and 24,930 tonnes. 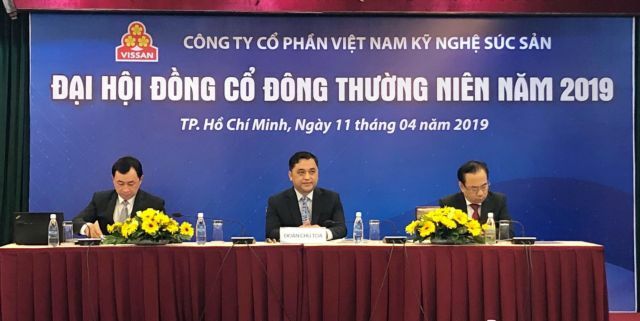 Speaking at the meeting, Nguyễn Ngọc An, the company’s general director, said the fresh meat segment faced difficulties last year due to an increase in costs, including a strong rise in pig prices, which resulted in higher prices and lower demand. Vissan’s revenue and pre-tax profit reached VNĐ4.46 trillion and VNĐ175 billion last year, a year-on-year increase of 15 per cent, but just met 97 per cent and 98 per cent of its targets, respectively, he said. Vissan launched 13 new processed products and entered the spices segment with the launch of meat seasoning fortified with zinc and Vitamin D3. This year, it opened the first Vissan Premium store to sell herb-fed pork and imported beef besides other fresh and high-grade processed foods. To meet the targets this year, An said the company would offer customers a new experience through new identities for its products, expand the premium store model and meet the increasing demand for nutrition and added-value of products. The company will also focus on expanding its distribution channels, do research to come up with new products and expand co-operation with pig breeding farms that meet VietGap standards to ensure steady supply of meat.